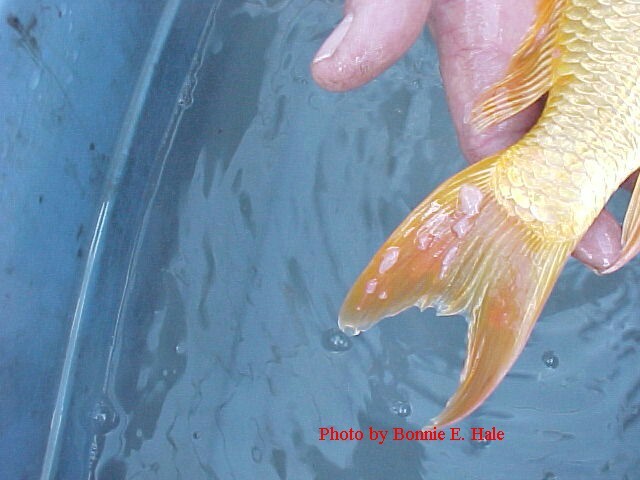 Carp pox appears as clear waxy spots on the fins and tail of koi and goldfish. While it is not harmful, it can be unsightly. Fish do not die from carp pox. It is a cold water virus that will heal on its own once the water warms back up. In the 90's I experimented with heating the fish that came form a cold water pond by gradually warming the water. In some cases it returns every winter when the water is cold and clears on its own once the water warms back up. Others report it never returns and others reports it returns every winter. No one "in the know" seems to know why it return in some fish and never returns in other fish. This fish came to me with Carp Pox and a horrible case of flukes. Fortunately there were no open sores, fin, tail or mouth rot that is commonly associated with the flukes. The above fish came out of a cold pond that had a temperature of 55 degrees. The method of treatment was to warm the water up to 80 degrees. I have found that in treatment of other fish with Carp Pox that heat alone will cure it very nicely. The hospital tank was set up and salt added to bring it to 0.3% salinity, which is always, my first step in treating any fish. A heater was added to the 25-gallon tank and set at 80 degrees. I then added 3 fluke tabs that were pre-dissolved to the tank. This picture was taken just 4 days later! You can see the difference that just 4 days of heat made. 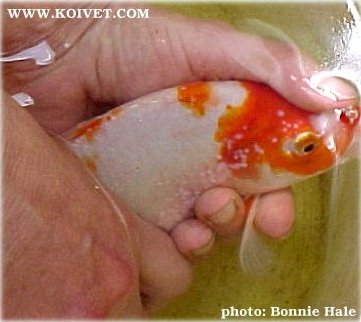 By the end of 7 days the fish was completely healed of Carp Pox and no visible signs were left on the body. Also by the end of 7 days all fluke were gone after 2 treatments. 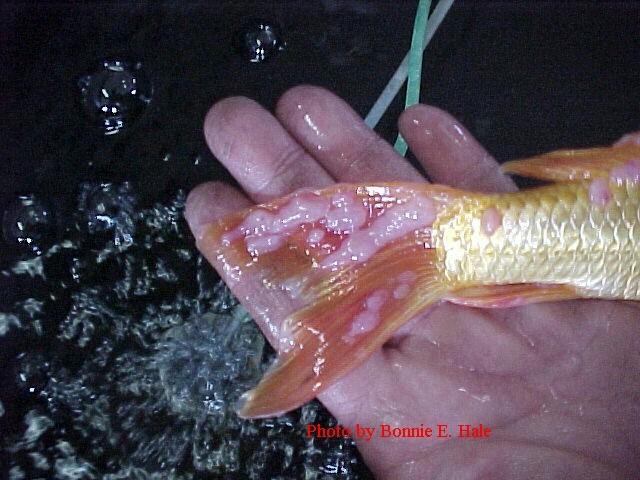 Carp Pox should be differentiated from other viral and non viral eruptions with a microscope. In very cold water, there are strains of Ich which will coalesce into large gel-like globs instead of causing the dusting of white spots. Biopsy is important. Carp Pox and certain cancers cannot be differentiated by pathologists in every case. This is another case of Carp Pox. The major difference is that this fish had the pox all over its body. You can see how the spots look small and "pinkish" in color.